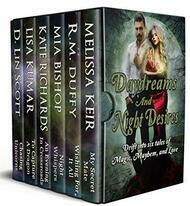 Daydreams and Night Desires...drift into six tales of magic, mayhem, and love. Fall for a Shifter Who Has Waited a Lifetime for his Mate…. As Sean shares his secret with Macy, can she learn to love a man who is something more, or will she give up on her own magical happy ending? What would you do if you were granted three wishes? After discovering a magical lamp and the beautiful genie Keara, Drew Preston thought he knew exactly what he wanted to make his life complete: the dream job, the dream woman, and the whole happily-ever-after life. But what if he made the wrong wishes? What if instead of the wishes, all he wanted was the genie? Rissa had life all figured out until the accident, but her world is turned upside down when she finds herself being hunted by a dragon in a magical land. With Griffe, her rescuer and guide by her side she finally feels safe and complete, but can she continue to trust him when she realizes he's hiding something from her? Shifters have never been this vampire's cup of blood, but Mane Wolf shifter Roberto may change that in a club called Crossroads. When Lord Eacion, leader of the dragon fae, visits Anni Brownston’s village, he takes over her life for a day—and one glorious night. But when the next morning dawns, will Eacion’s rash actions and her own fears about her lame leg kill any future between them and consign her to a fate they will both abhor? As a female fairy, Fiona craves a mate but knows there is none left after the Great War wiped out all fae. Human Bryce Hollinsworth will do anything to save his grandfather, even if it means trusting another species. Can Fiona and Bryce overcome mutual distrust and fear to fall in love?